Located in the Heart of Hamilton! 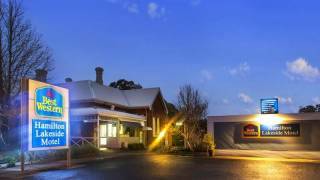 Hamilton Lonsdale Motel formerly Best Western Hamilton is located in the beautiful surroundings of Hamilton at the base of the Southern Grampians just three hours out of Melbourne. While staying here you can explore the abundant waterfalls, lakes and countryside. Hamilton it great for those who enjoy bush walking, bike riding, bird watching and fishing. The hotel is centrally located between Melbourne and Adelaide, and is an ideal stopover if you are travelling the Great Southern Touring Route. The Motel rooms have been fully renovated to 4 star standard. All suites and rooms at Hamilton Lonsdale Motel are on the ground floor and feature Foxtel and free wireless internet service. Breakfast is available served to your room or the Merino Room. The Hamilton Lonsdale Motel is a short walk to local restaurants, fast food venues and entertainment facilities. A leisurely stroll will take you to the Botanical Gardens, Performing Arts Centre and Art Gallery. For more information please contact The Hamilton Lonsdale Motel and they will be happy to assist you with your enquiry. Deposits: At time of booking a one night’s deposit will be taken from your nominated credit card to guarantee your reservation. All major credit cards accepted along with eft. A deposit for your booking forms a contract, which BEST WESTERN Hamilton will honour. Off Peak - Standard cancellation notice of 48 hours prior to arrival is required, in order to avoid a no show charge of one full night’s tariff. When the required 48 hours notice is given, a $25 cancellation fee will apply and the balance of deposit will be refunded. Peak Periods – Deposits are non-refundable and if the booking is cancelled or the guest leaves early then full payment will be required. Refunds: Refunds are not provided if an occupant elects to vacate the room prior to the booked date of departure.